Nimo TV, one of the country's leading video game streaming platform, is an excellent past time for students who love gaming and learn new skills at the same time. It offers 8 – 12 MP quality live streaming and can be accessed via mobile or PC make it easier for everyone to start live streaming as a hobby and eventually make it a career. Nimo TV is a leading global platform that allows millions of gamers from all around the world to play and broadcast their games to other like-minded players building a community of players, gamers, and fans that drive conversation, and allows peer-to-peer rewards and recognition. Utilizing a high-quality interactive technology, audiences can interact with streamers, and gain access to exclusive esports events and tournaments, along with unprecedented access to the top streamers from across the region. Nimo TV recently announced its partnership with AliSports as Broadcasting Partners for the World Electronic Sports Games 2019 happening in Chongqing, China. The Finals with 36 Teams coming from around the Globe will partake in the highest prize pool of $5.5 million across multiple titles. 6 Teams from the Americas, 11 Teams from Europe, 13 Teams from the Asia Pacific, 2 Teams from Africa and 4 Invited Teams will try to prove their worth and claim supremacy. Alongside the main competition 8, all female teams will also be participating at the final event. The all-female teams are from the Americas and Europe with both 2 Teams and the Asia Pacific with 4 Teams. 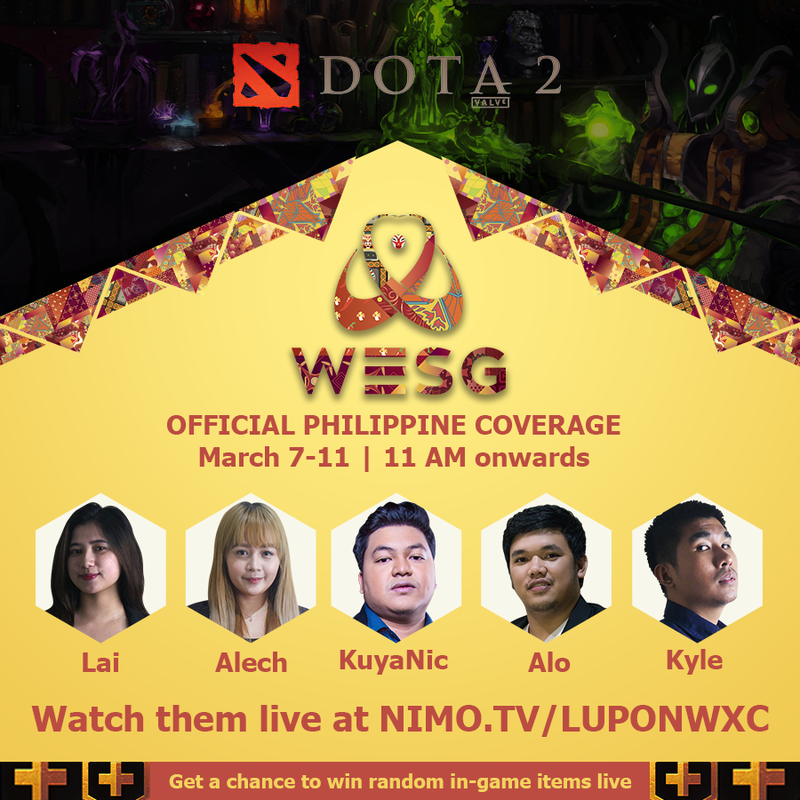 As the live streaming giant continues to provide quality and exciting content to its followers, Nimo TV tapped Project Lupon headed by Nico Nazario or KuyaNic to broadcast the said tournament from March 7 – 11 from 11 AM onwards. Dota 2 fans should be excited to hear KuyaNic, Alo, Kyle, Alech and Lai as they provide a blow-by-blow update of the tournament. 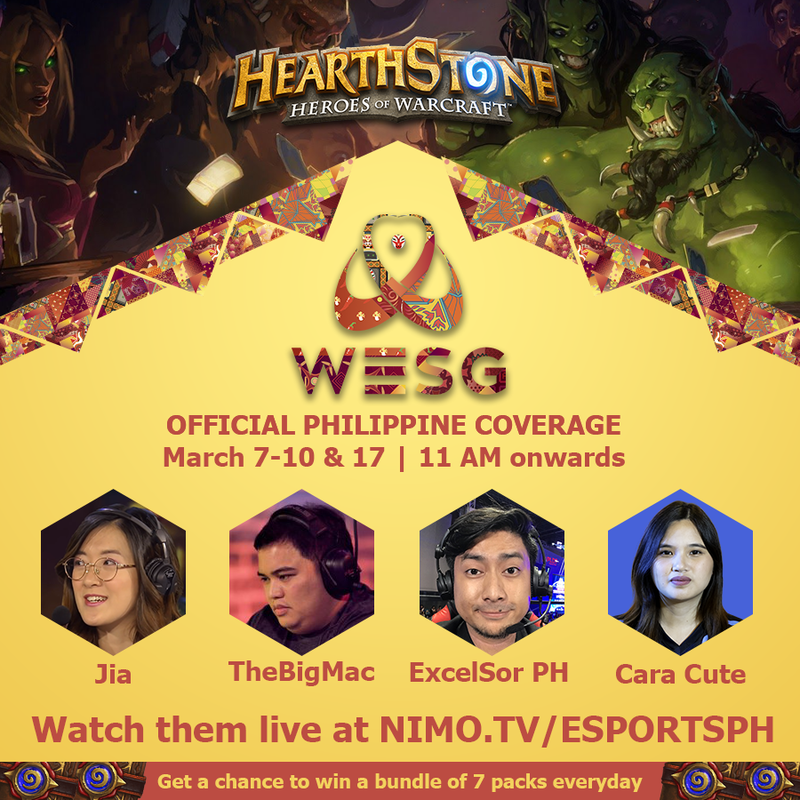 TheBigMac, ExcelSor PH, Lia, and Cara Cute will join the HearthStone community. 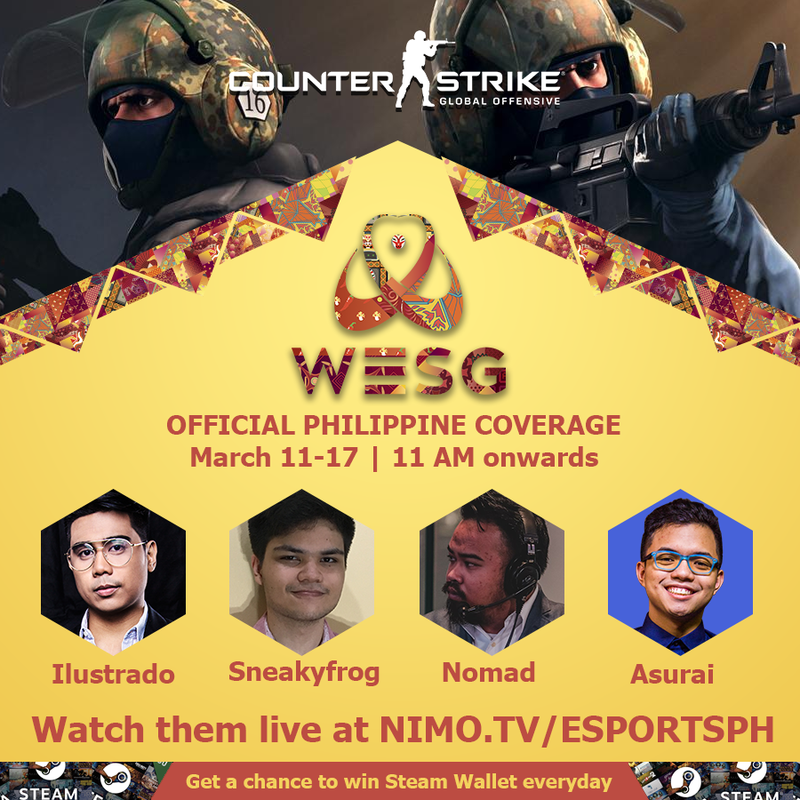 While Iliustrado, Sneakyfrog, Nomad, and Asurai will join its Counterstrike fans in discovering the next global champion. The all-star broadcasting teams are excited to comment and give their analysis of the WESG 2019 matches and will also throw in some in-game items, steam wallets and a bundle of 7 packs daily. Nimo TV continues to strengthen its global presence in the world of esports through its partnership with Alisports as the official broadcasting partner of the World Electronic Sports Games (WESG) for the WESG 2019 happening in Chongqing, China. The live streaming giant has given the rights to cover and broadcast the WESG event through the app making it easier for the subscriber to get a blow-by-blow update of the tournament. “We are excited of brining WESG 2019 to everyone via Nimo TV” Henry Zhao, Nimo TV Overseas Executive. “Nimo TV and Alisports share a common goal of bringing esports closer to the world, and we believe that this partnership made us achieve our goal,” Zhao added. Alisports established the WESG series in 2016 as an international esports tournament. It currently holds the highest prize pool of any third-party competition across multiple titles amounting to $5.5 million. As an “Olympic-style” tournament, WESG follows the Olympic standard where teams must consist of players from one nationality to emphasize national pride and encourage fans to partake in the competition. Nimo TV remains true to its core of bringing exciting content for all of its subscribers. Inspired by the positivity, generosity and the friendly nature of the earth pig. Nimo TV launches another exciting promo titled “Give an Ang Pao to your favorite Streamer” from February 1 to 8, 2019. What is an Ang Pao? Ang Pao in Chinese and other East Asian cultures is a gift customarily given during holidays or special occasions. As a gesture of gratitude and appreciation, the red colored envelope denotes good luck and ward off harmful spirits. Nimo TV’s virtual Ang Pao, an in-app feature can be given to any streamers you follow to help increase their popularity. Each Ang Pao valued at 100 coins that can be used to interact with your favorite Nimo TV streamers. By watching your favorite streamers’ LIVE streaming, you can claim the Daily Coins Reward. The longer you stay, the more coins you earn and the more Ang Pao you can give to your favorite streamer. 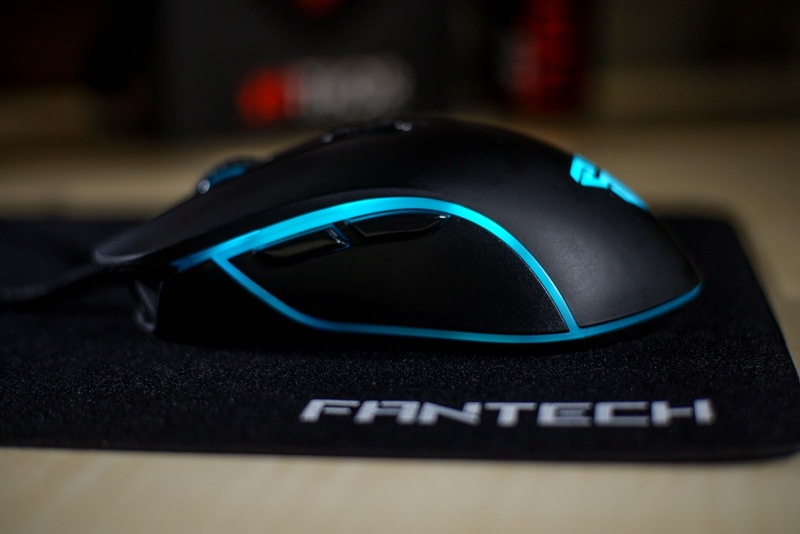 Fantech X9 Thor Gaming Mouse: Best Budget Gaming Mouse? 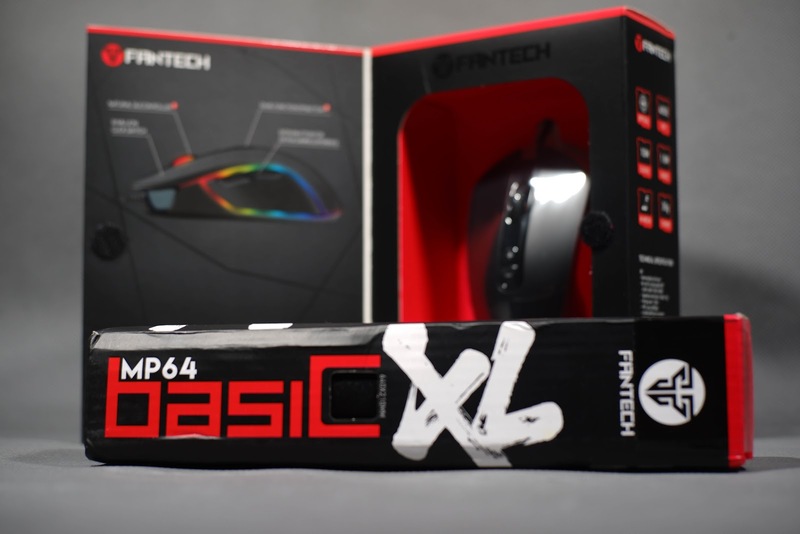 Also, this is part of the on-going blog series called Budget Gear Brawl where I will be trying out these budget gaming gear and give you guys my thoughts about them. 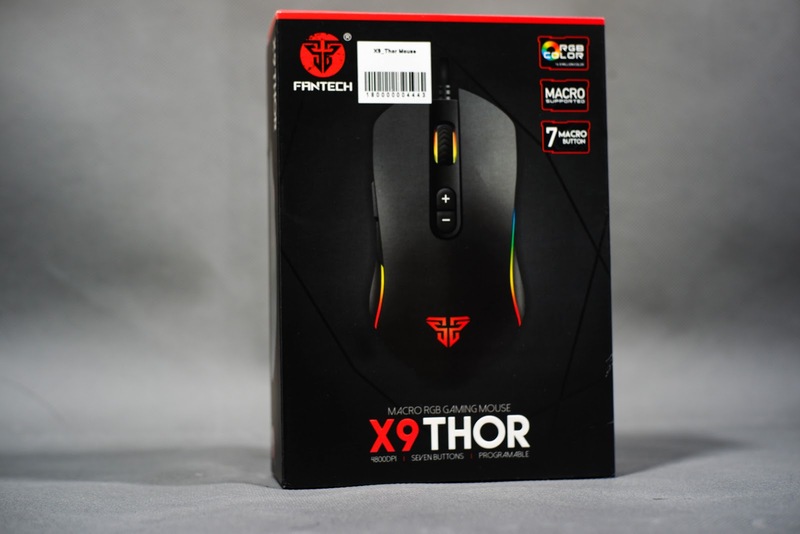 Fantech have a lot of gaming mouse in their arsenal and I just happen to stumble upon their brand on Lazada particularly the X9 Thor Gaming Mouse. You can check out my blog post about Fantech here. Since I need a new mouse for my blogging/Youtube needs and I'm doing this blog series, might as well buy this one and try it out! Like I've said in the video I chose to look at 3 aspects of this mouse for the review. I won't even consider the price since it is budget gaming gear and most prices will be below PHP1000 and I believe that the quality is more important than the price(unless you're really tight in the budget). P.S The Fantech Basic XL Extended Mousepad is only 199php from Lazada. 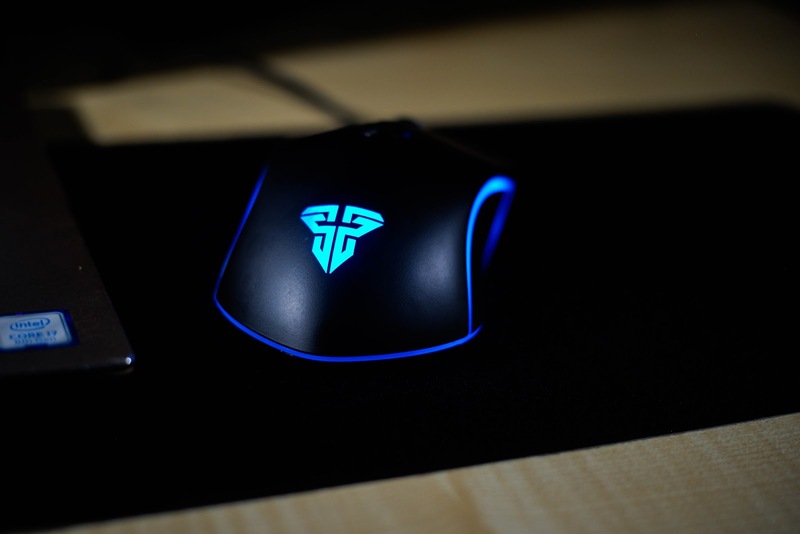 It is made of plastic but it has some weight in it that is good for control of the mouse and of course slightly differentiates it from other cheap mouse. The Buttons are decently made. The mouse have 7 buttons that are customizable using the X9 Software. The Scroll wheel have a very good gripping silicon cover. I love it. Another thing that alot of cheap gaming mouse don't have is a durable cable. While I haven't totally screwed around with the cable that much, I think it is very durable. 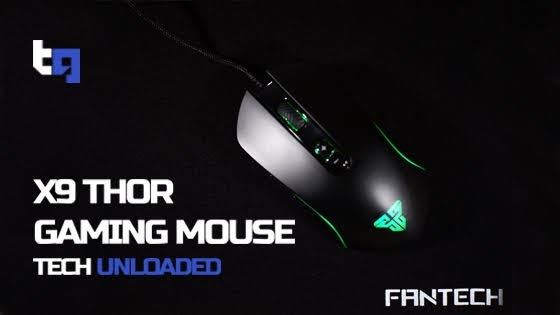 The Fantech X9 Thor Gaming mouse have a braided mouse cable with USB Type A Connector. The cable is very sturdy in my opinion. 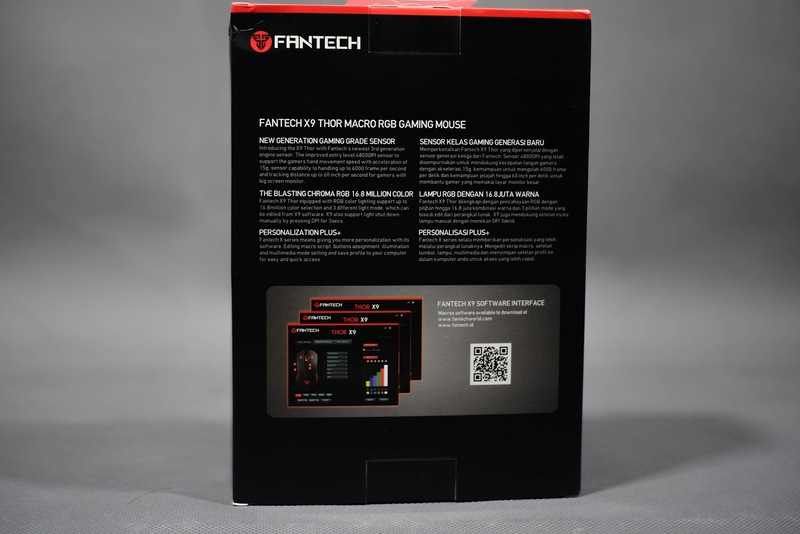 Fantech prides itself with its revolutionary gaming grade sensor. While I don't see anything new to what the X9 Thor has, it probably has to do with its integration with the X9 Software and the DPI settings calibration. My observation is that, it does pretty well when used on a mouse pad but on a semi reflective surface like my laminated wood table it performs a bit off, which I guess is normal since most optical sensors use reflection of the light to determine accuracy and movement. Like I said in the video, I have huge hands which makes finding a gaming mouse a bit of a challenge since I need a bigger size ones than most people. I used to have an Imperio branded cheap mouse from I think CDR King or Octagon(I forgot), and it is big enough for my hands which I really like. 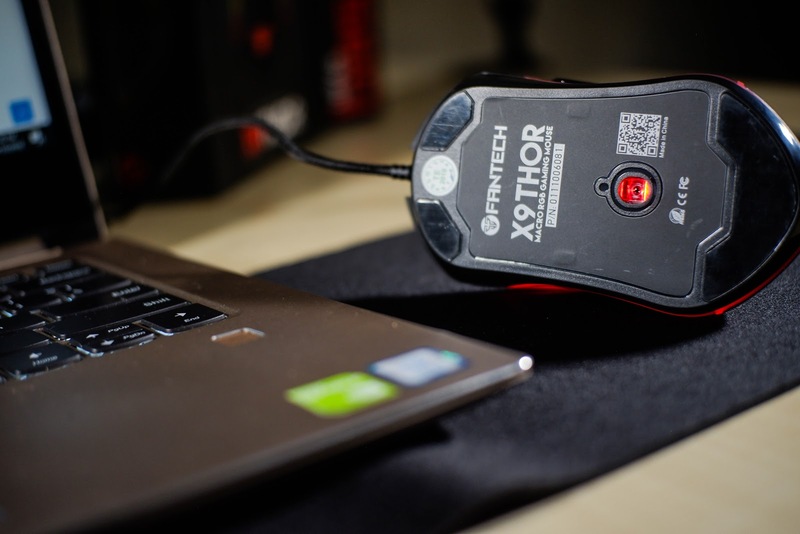 The Fantech X9 Thor Gaming mouse is a bit smaller than that so it took some adjusting to it. It did get a bit better after more than a day of use and now it feels good to my hands now. I like how they separated the DPI Buttons so that you won't accidentally change your DPI during crucial moments in game and of course still get your desired performance from it. The mouse feels very good to my hands. It has a bit of weight from the back side of the mouse which is good for maximum accuracy I think. So you don't end up flailing the mouse around or have full control on it. 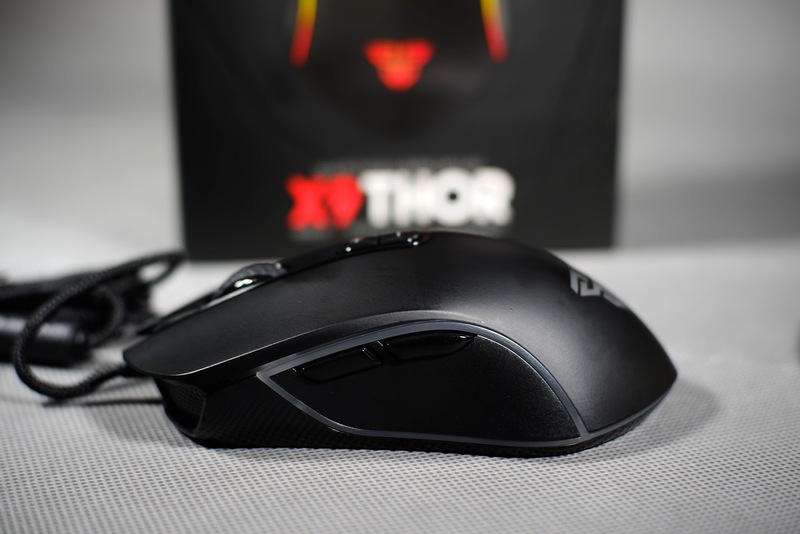 The Fantech X9 Thor Gaming Mouse has a polling rate of 125hz. If you don't know what Polling Rate is, it is the rate at which the device(in this case, the mouse) reports to the computer it's location. So at 125hz, it reports the location to the computer 125 times per seconds or 8 per millisecond. During my whole use, it is very responsive and accurate to where I want it to be. 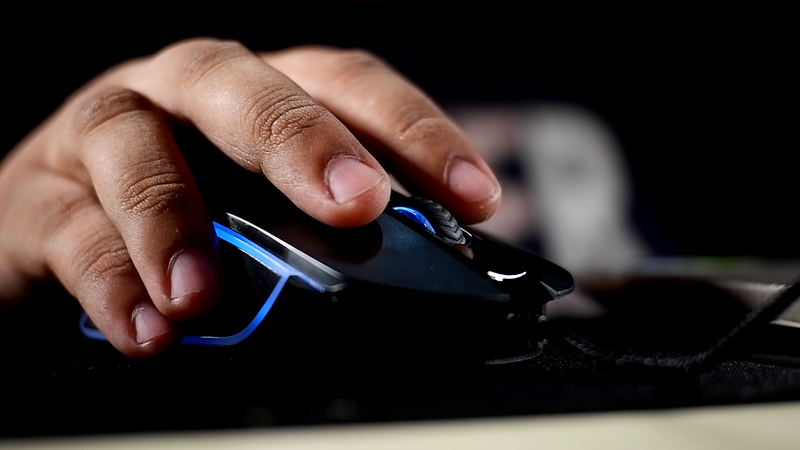 The click to execution ratio is fast enough for my needs whether its in gaming or editing or other productivity use. The X9 Software is free to download on their website. 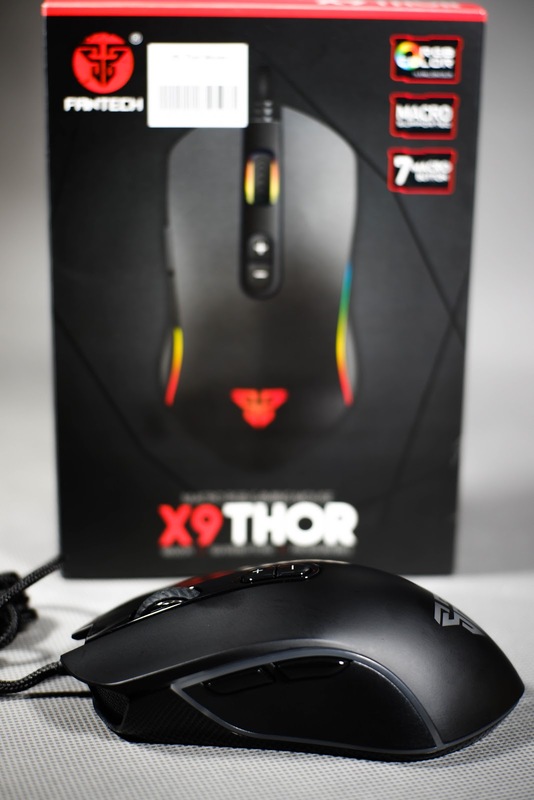 You can customize a variety of settings for the X9 Thor Gaming Mouse. I love how it is kind of intuitive to use and the changes apply instantly so you get the results of the settings as soon as you hit apply. 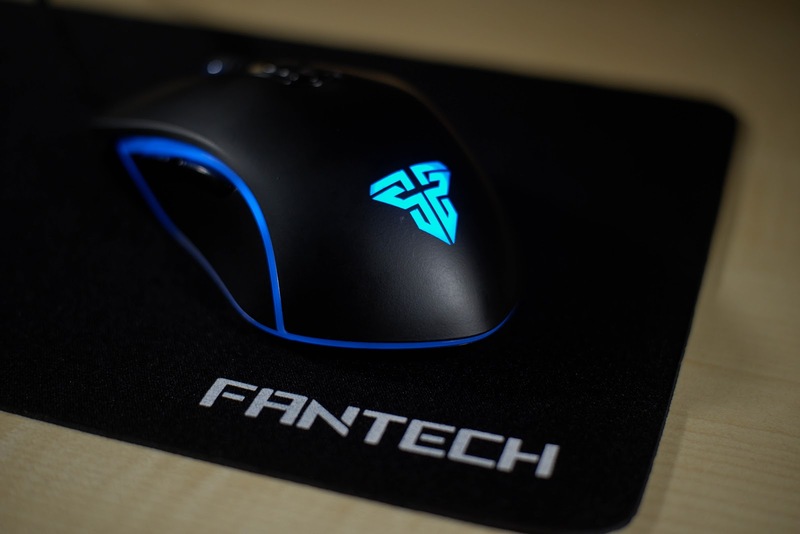 The Fantech X9 Thor Gaming Mouse as well as the Basic XL Extended Mouse Pad can be found on Lazada and Shoppee. Other products of Fantech are also available there. For Stores that carry Fantech, I only see Facebook sellers and have a fanpage called FANTECH EXPRESS PH which seems to be the legitimate page for Fantech PH. I'm not totally sure at the moment. 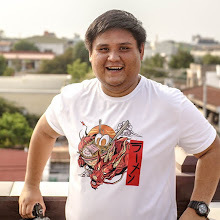 I also found their website: https://www.fantech.com.ph/ and I believe they are handled by Ace Gadgets Store which is a legitimate store in Taguig. I'm actually quite impressed with its price to performance/features ratio. I didn't expect that at 399php I get features that are otherwise only available to higher end devices. 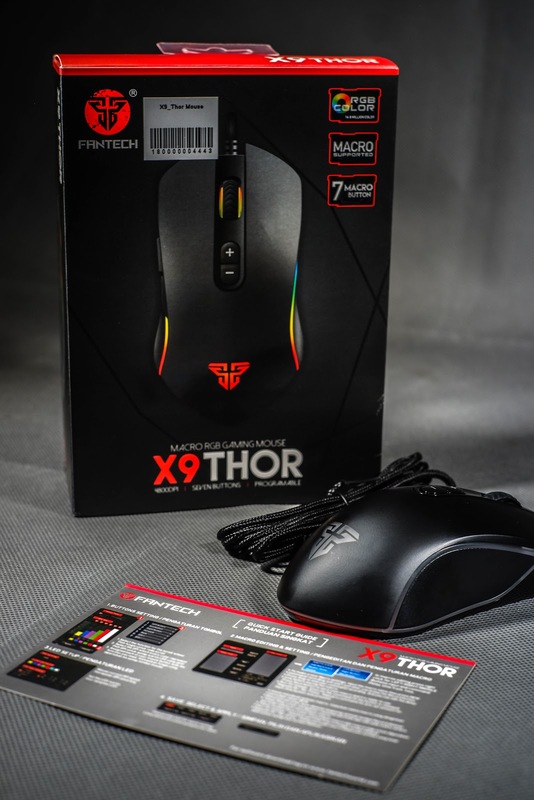 The Fantech X9 Thor Gaming mouse is not for pro-gamers though. I've had people say that for FPS games, this is not a good mouse since it has a bit of a delayed response, but for me personally, it's workable. Either way, it is still a good mouse to have especially if you're very tight on budget. Thank you guys for reading this blog! What do you guys think about this mouse? Will you buy this mouse? What device should I review next? AOC and Philips Launches Their New Products In The Philippines! AOC, the number one monitor brand in the Philippines known for their impeccable quality gaming monitors, and Philips, a well-known brand for making high-performance and innovative display solutions for home and businesses, proudly launches their new products in the Philippine market. Committed to bringing the best for consumers, Philips is releasing three new monitors in the market: all in different form factors and are HDR certified. As their display technology continues to evolve, their products stay consistent in being environment friendly and flicker-free. Meant for those who are looking for the best cinematic experience for their home setups, or even for the prosumers who need a color accurate display, these new Philips monitors will not disappoint. Perfect all-around display with stunning image quality that are vivid and crisp that stretches from edge-to-edge. With its Anti-blue light technology, this monitor is easy on the eyes in a compact slim design. The V Line of monitors is using an IPS display with excellent viewing angles making it possible to view the display unlike standard TN Panels. The Philips IPS displays gives you remarkably crisp images perfect for applications which always demand color accuracy and consistent brightness . Experience real immersion with Phips curved monitors. Available in 24”, 27”, and 32” inches, the curved E Line monitor offers truly immersive experience with stunning Full HD image quality with its Ultra-wide color technology that brings your images alive! This line of monitors has a VA LED display that uses an advanced multi-domain vertical alignment technology which gives you super-high static contrast ratios for extra vivid and bright images. 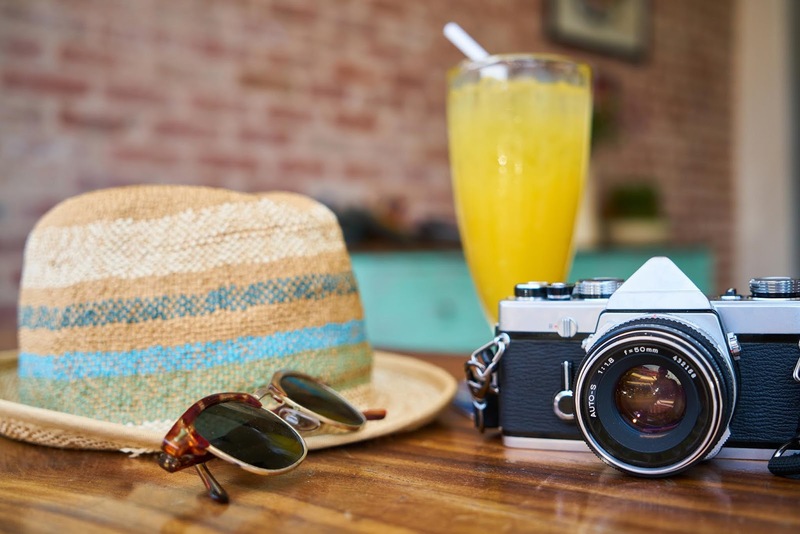 While standard applications are handled with ease, it is suitable for photos, web-browsing, movies, gaming, and demanding graphical applications. 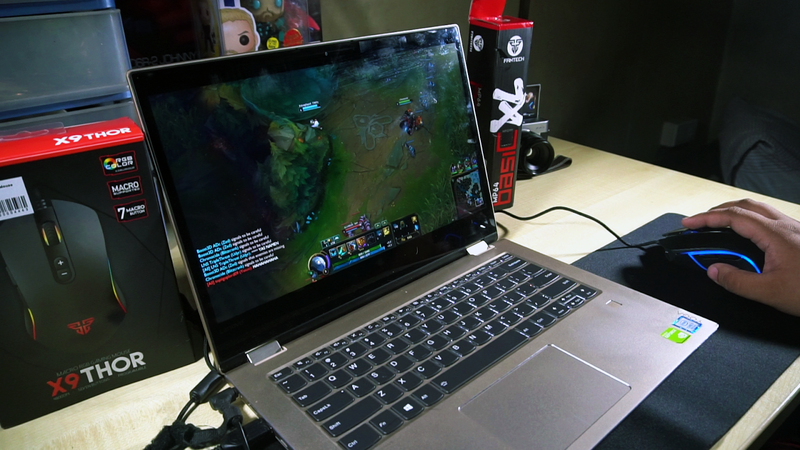 Equipped with AMD Freesync technology, gamers can expect fluid and artifact free performance virtually at any framerate because of its smooth quick refresh and ultra-fast response time. Philips Monitors is also excited to announce their collaboration with 20th Century Fox as they will be spearheading the premier of Bohemian Rhapsody in Philippine cinemas nationwide. Fans can avail of free movie tickets for two, along with limited edition Philips swags (including t-shirt, tumbler, and umbrella), for every purchase of any Philips Monitors 24” and above. The number one monitor brand in the Philippines, AOC is also excited to bring their new monitors for both gamers and consumers alike. These new selections of monitors are packed with high refresh rate and HDR certified panels that will bring you the competitive edge in gaming as well. Equipped with AMD Freesync 2 technology, gamers can ensure to have the best tear-free visual experience while playing their games in the maximum frames per second that their gaming PC can deliver. These new monitors are born to battle. The new G2590PX and G2790PX are the new gaming monitors developed for awesomeness. Available in both 25” inches and 27” inches, it’s TN panel has thin bezels, has a 1ms response-time and 144hz refresh rate powered by AMD Freesync technology for fluid and artifact free performance virtually at any framerate. Gamers are sure to love this monitor because it has a low input lag control which significantly decreases delay between the video source and display. It also features a height adjustment stand which not only allows gamers to adjust the height of the monitor to their personal preference, but it also swivels for better viewing at different angles. AOC G1 series is the newest curved monitors that will expand your world. Equipped with a VA panel that features 144hz refresh rate and 1ms response time, gamers will enjoy the fluid visual experience that these monitors offer. Sporting a 1.5mm ultra narrow bezel with a 5mm black screen border makes it perfect for a multi monitor gaming setup. Available in both flat and curved screens, the B1 series bring affordability on the table without compromise on looks and features. In its comfortable and super slim form factor, the B1 series has a 21.5” and 24” panel and is packed with features. The Screen+ software splits the PC workspace in four self-contained panes to group applications for easier viewing. Screen+ also supports multiple monitors. The B1 also boasts of being flicker free which reduces eyes strain and discomfort. And to top it all, the included software also enables the user to set a low power configuration to save on energy. These new Philips and AOC Monitors are now available in partner retail store branches nationwide: PC Express, PC Worx, Octagon, Thinkingtools, Computerworld, ThinkPC, Vivocom, and PC Chain. If you need more information you can refer out to the social media pages of AOC Monitor PH and Philips Monitors PH. GAME CHANGING NVIDIA RTX 2080 TI AVAILABLE FOR PRE-ORDER! Nokia 3310 celebrates 18th birthday with price blowout! DJI: See The Bigger Picture Watch LIVE! Copyright © 2018. Tech Gabster All Rights Reserved.